In the old days of two way radios the user needed to know what channel to be on. Not anymore. Our new digital radios operate more like cell phones. The radio decides when it needs to move to a new tower. All you have to do is press the push to talk button. It's that simple! Being able to communicate clearly with your entire fleet is important. A simple misunderstanding can lead to big problems. NexWave digital wireless provides clear digital audio over a wide area helping to eliminate misunderstandings. Being able to tell where your fleet is and how efficiently they are running their routes can save you time, fuel and money. With features like Geo-Fencing, event notification and extensive reporting you'll be able to streamline your business. Contact 800-356-3200 with any support issues. We pride ourselves on providing top notch sales and system support. If you have any questions on how your radios work or want to know how one of our services could help your business, contact us and we'll be more than happy to assist you. Being able to monitor your fleet's communications is important but not the only benefit. If someone calls in with an issue or problem another employee may have a better or more effective answer. This can save you time, money and help you provide great customer service. Fleet wide communications are the norm but their might be the occasional need to communicate privatly with an employee. NexWave offers private one to one calling at no additional charge. More and more companies are relying on GPS tracking to help their bottom lines. NexWave GPS gives you all the tools to monitor your fleet and make the appropriate changes. Do away with cell phone overages and switch to the only true unlimited calling network. Never worry again about going over your mintues or racking up large text messaging bills. NexWave IP Network Upgrade Completed! We have completed our upgrade to a more secure and faster IP network. Not only will this allow us to handle more traffic but will enable us to continue to add features and improvements to the system. In addition to these benefits, it will also allow us to better monitor the network and respond to potential problems faster limiting or eliminating network downtime. If you have any questions about this upgrade, please contact one of our NexWave support specialists. 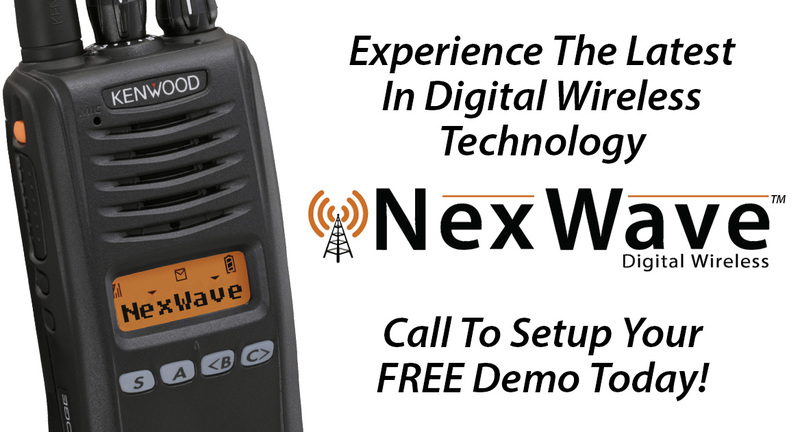 NexWave Digital Wireless Has Launched! We have completed the rebranding of our digital wireless service now know as NexWave Ditigal Wireless. Along with the relaunch is a host of new services and options available to our customers. 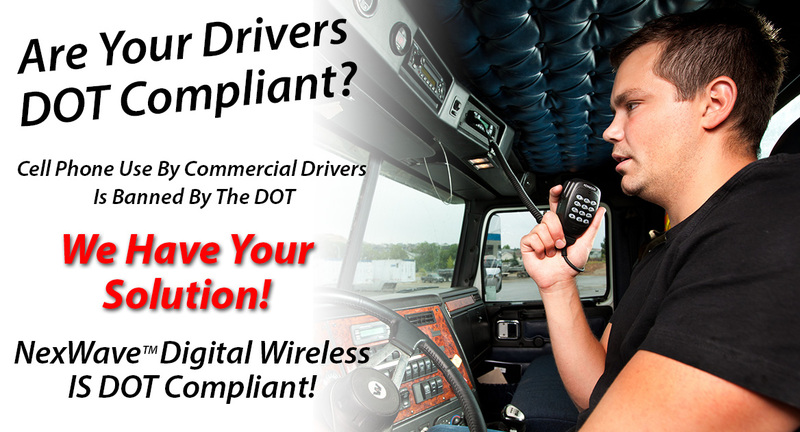 The DOT ban on cell phone use by commercial drivers has been in effect since January 3rd, 2012 and a lot of companies are still unaware of this ruling. This DOT rule applies to those operating a CMV pursuant to a commercial driver's license (CDL). The new rule clarifies that holding, dialing and reaching for a mobile telephone is no longer acceptable. 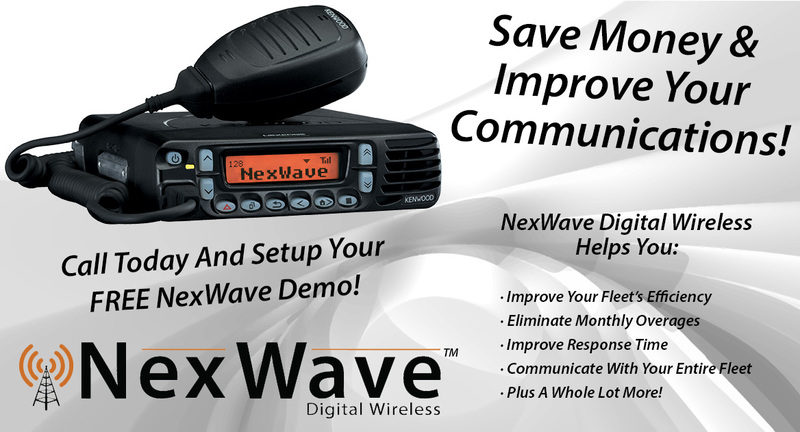 Services like NexWave Digital Wireless along with two-way radios are not considered mobile telephones. Keep in mind that violations will incur federal civil penalties of up to $27,750.00 per offense and multiple offenses can lead to driver disqualification. Contact one of our sales representatives to setup a FEE NexWave demo and start your path to DOT compliance. Here are just a few businesses using our NexWave Digital Wireless service. Let us show you how we can help your business through the use of one of our many NexWave Digital Wireless solutions. Our messaging service can save you time and hassle when trying to communicate information. We provide everything from simple canned messages to full blown messaging software.